This short but eloquent book is a well-documented and assiduously built thesis is strip up Muslims’ imagination, to awaken them from a state of indolence and to put them on the right back to go ahead with other advanced Nations of the World. 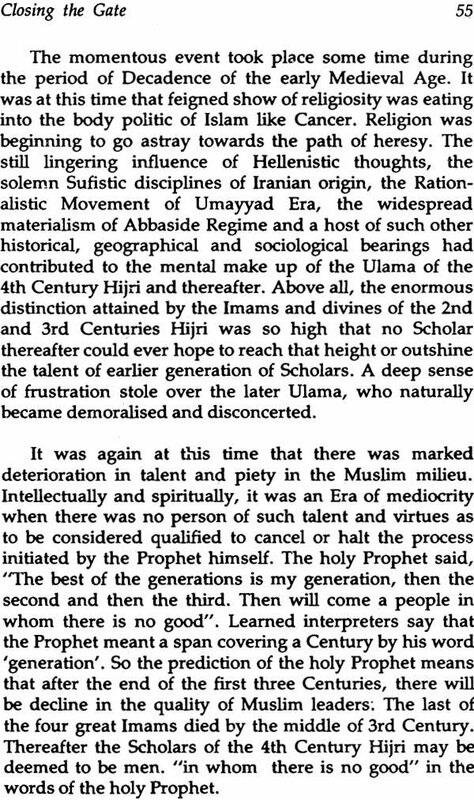 Discerning Scholars of Islamic Culture are aware of the fact that the process of Ijtihad had led the Muslims to intellectual creativity so long it was kept in operation and that its closure led to all-round stagnation in the Muslim community for the last one thousand years. The publication boldly breaks new gounds to show that closure was the motivated work of a band of frustrated and self-seeking Ulama of no good repute and that their decision was unwise and invalid. The process of Ijtihad must therefore begin to operate now as in the wiped out to oblivion in the irresistible blizzard of changes threatening to transform the 21st Century human Society. The Worldwide Brotherhood of Islamic Peoples may rightly claim the honour and pride of eminence on two glorious facts about their Religion. The First one is that “The Qur’an is the most widely read book in existence”, as observed by European Classical Scholars on Islam like Philip K. Hitti, Charles Potter and others, none of whom are known for their sympathetic approach to Islam. The second one is that the well-known American Author Prof. Michael H. Hart undertook a serious and extensive study of great men of all times and of all countries ever born in the World. He took note of the features of greatness and distinction of each of them, drew up a list of 100 top-most persons from amongst them, arranged the selected men in order of maximum contribution by them to the advancement of World Civilization, and published the final result in his book “The Hundred”. This merit list is headed by Prophet Hazart Muhammad, being no. 1 among all the men ever born to breathe on the face of the Earth. Such is the Prophet of Islam, who in the best of his sagacity, made a wise provision in order to maintain the freshness and compatibility of Islamic Laws for all times and all climes. This unique provision based on Qur’anic rudiments, was styled Ijtihad. It was implemented by Imams and divines for 300 years after the lifetime of the Prophet. About the 4th century Hijri, some frustrated and motivated Ulama of no good repute, guided by personal considerations, are reported to have convened an assemblage of Ummah and passed Decree banning the provision of ijtihad for all time thereafter forward were forbidden and declared sinful. People could look back to the past for seeking guidance for all their present and future needs, but could not advocate, preach or practice any new concept or fresh thought, which were condemned as unholy innovation. The action thus taken is known as “Clothing the Gate of Ijtihad”. The saner elements did not agree and raised voice of protest from time to time. Dr. Sir Muhammad Iqbal described the move as “Pure Fiction”. The present Review, after sustained examination of all aspects, came to the conclusion that the closure of Ijtihad was a measure lacking in scriptural validity, and was in fact, a hoax played by a band of frustrated Ulama of no good repute. The Review calls for ignoring the so-called ‘Decree’ and for re-opening the process of Ijtihad in right earnest. 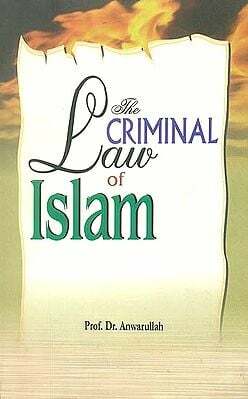 Contents of this book cover some special topics such as God’s attributes, Islamic Laws etc. Section III relates the Changeful Universe, particularly for information of obscurantist who believes that since Ijtihad has once been closed by the consensus of Ijma, it can never be reopened at any time. In fact, this is a miss-conceived idea. God alone is not subject to any change, but everything else in the Universe, including even the texts of scared Scriptures and the imperative Commandments of God have undergone change under exceptional circumstances, as shown in Section III. So the decision to close the Gate of Ijtihad can also change if there are good reasons for it. Inclusion of such special topics in the book may prove useful to general readers and particularly to Ijtihad Scholars, who require a broad out-look and clear vision to enable them to formulate new Rulings or to re-interpret old ones correctly, without feeling handicapped for lack of knowledge on allied matters. Moreover, in addition to comprehensive treatment of the principles and operation of Ijtihad, the book copiously deals with knowledgeable matters on the tenets and practice of Islam, so that the reader may become well-informed about the Religion of Islam. It is the earnest hope of the author that this short book may be perused with patience, and with open and unprejudiced mind. It may perhaps help to free the reader’s mind from the clutches of Medievalism, the heritage of confusion and the legacy of long-standing misconceptions if any. He may then draw his own conclusion, and possibly get ready to work for undoing the stagnation that has bedevilled the Islamic Society for over a thousand years. Enlightened Muslims feel deeply concerned at the widespread stagnation prevailing in their community-life for Centuries. The malady is prolonged extensive and persistent, having grasped all spheres of their activities—religious, social, educational and economic. God-fearing intellectuals and patriots like Allama Shibli Nu’mani, Syed Sulaiman Nadwi, Altaf Hussain, Syed Ameer Ali, Dr Sir Muhammad Iqbal, Sir Syed Ahmad khan and others died crying for awakening their sleepy community to rise again and resume leadership of the World-stage, where they once stood as the ‘Torch-bearers of Civilization’. Eminent Spiritual Leaders and Defenders of Islam like Mujaddid-e-Azam Imam Ghazali, Maulana Jalauddin Rumi, Shaikh-ul Islam Hafiz Ibn Taimiyah and Shah Waliullah Mohaddis Dehlavi bewailed at the retrogression in Religious practice from the ideals of pristine Islamic Faith held by the Sahaba and the First generation of Believers. Imam Ghazali held the view that debasement had crept into the study of Theology as the Ulama of his Age had developed sectarian outlook, and were consequently guiding the course of religious education along wrong lines. This view was expressed about a thousand years back when the position was already bad. The continuation of religious education on the same wrong lines ever since then has made matters much worse by now. As a result of mis-leading education all these Centuries, Muslims have been losing ground in the field of Spiritual Attainment as well as in worldly achievements, and failing to vie with other communities in different walks of life. In Consequence, the Muslims are left far behind other World communities. Their high literacy, growing poverty and habitual conservative mentality to look backwards to days gone by in all eventualities has involved them in a thousand fetters of their own making. Their all-round unprogressive condition has seized them like tentacles of an Octopus, from which retrieval is an unsurmountable task for leaders of the community. The holy Qur’an teaches that life is a process of progressive development. Life is not static; it is moving. Movement is a sign of life, a mark of progress, an order of Nature, while denial of movement is an indication of stagnant at the level of Medieval Age consciousness. The world has gone far ahead and is confronted today with new forces implanting profound changes in human affairs. The Muslim community must now look forward, re-fashion its general outlook, re-structure its social frame and move out in search of new terms of equality with other World communities. It requires a break-through in perception, a change in intellectual approach in which healthy thinking may thrive. Honestly, the Muslims should not build castles in the air by imagining that they are not concerned with lowly mundane affairs because their centre of attention is the other world. They must not forget that their holy Prophet had achieved ideal success in Wordly life in addition to instilling Religious and Spiritual acumen among a vast section of humanity sunk in the depths of ignorance and profligacy. It was through emulation of the Prophet’s eminent example that Islam could develop within a short span of time from a small Arabian nomadic community to a progressive, prosperous and civilised World Power, simultaneously projecting a major Religious movement in the world. The basis of such phenomenal advancement in temporal as well as spiritual realm, was the invaluable guidance received from the Holy Qur’an and the holy Prophet, both offering incentive and direction to the believers to rely on free personal judgement, next to acting on Scriptural principles. Justice Syed Ameer Ali- Dr. K.G.